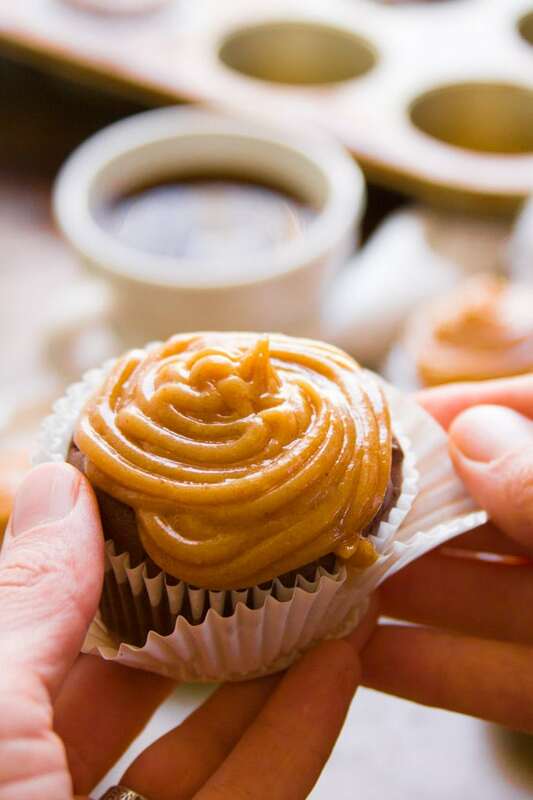 Studded with sweet chocolate chips and topped with rich and creamy peanut butter buttercream frosting, you’d never guess these luscious chocolate peanut butter cupcakes are totally vegan! Back in the early days of this blog I kept very close tabs on what posts were getting the most pageviews. I had a little widget in the sidebar that displayed photos of my top five most popular posts and one day I noticed that they were all chocolate. I totally thought I’d cracked the code. Post nothing but vegan chocolate recipes. That’s what everybody wants. I might have to eat a few extra brownies to make it happen, but I was willing to take one for the team. Looking at this site now, I obviously reconsidered. I eventually realized (1) I couldn’t handle all that chocolate, and (2) you guys really just wanted dinner recipes. It’s probably better for all of us. But I did go on a mini chocolate frenzy, and these cupcakes were one of the recipes that came out of it. I’ve made them a handful of times since first posting them and I decided it was time to give the photos an update and make a few tweaks to the recipe. I can tell you this about these cupcakes: if you want to impress people with how delicious and decadent vegan desserts can be, make these. I’ve served them at a bunch of gatherings, often to people who didn’t even know they were vegan, and gotten nothing but compliments and declarations on how rich and decadent they were. I adapted the cupcake recipe from this basic vegan chocolate cupcake recipe. (It was one of my first vegan baking wins and I was pretty darn proud of myself!). To veganize the cupcakes I swapped out milk and butter with vegan milk and butter (easy!) and use a flax egg in place of the chicken egg. A flax egg is super simple: ground flaxseeds + liquid. It gells up and takes on an eggy consistency. For extra richness, I added some chocolate chips into the batter. 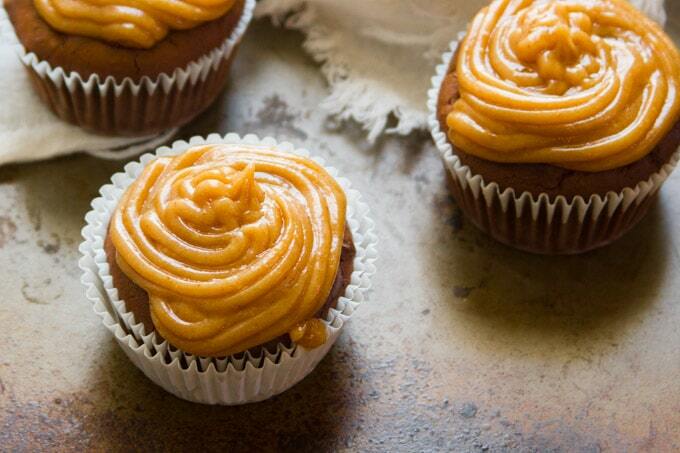 The frosting is much like a basic buttercream frosting, but with vegan butter and the addition of peanut butter. 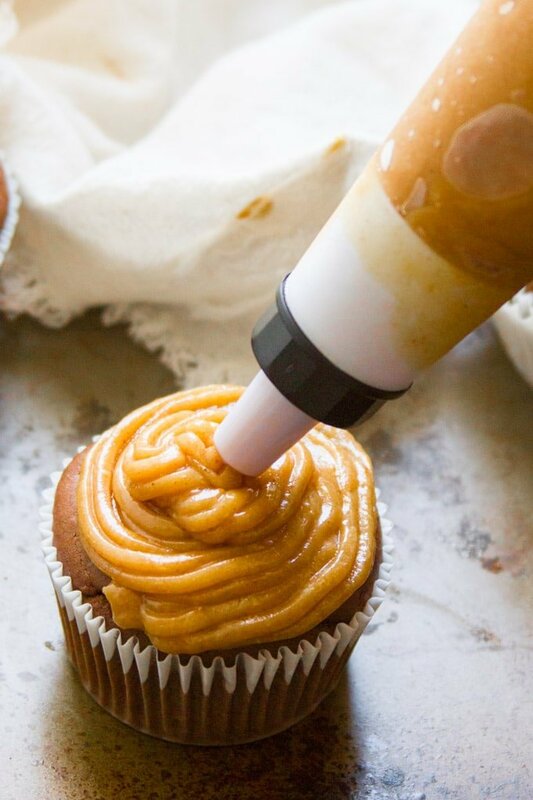 You can use natural (runny) or conventional peanut butter for the frosting. The conventional kind works better if you’re looking for a classic buttercream style frosting. I usually end up using natural because that’s what I buy. The frosting will be glossier (like in the photos) and not quite as firm, but every bit as delicious. If you decide to use natural peanut butter, I recommend chilling the cupcakes (especially during the summer), until ready to serve. Did your cupcakes fail to rise? Old baking powder is probably the culprit. Test yours by sprinkling some in a glass of water. It should fizz. If it doesn’t, toss and replace it. Not all sugar is vegan. In the United States, most granulated sugar is processed with bone char. Look for organic sugar (which doesn’t use bone char) to keep the recipe vegan. For vegan butter, try Earth Balance or vegan I Can’t Believe It’s Not Butter! For vegan chocolate chips, try Enjoy Life. Studded with sweet chocolate chips and topped with rich and creamy peanut butter buttercream frosting, you'd never guess these luscious chocolate peanut butter cupcakes are totally vegan! Whisk 1/4 cup of milk and flaxseed together in a small bowl and allow the mixture to sit for about 10 minutes to gel. While the flax mixture sits, preheat the oven to 350° and line a 16 cavity muffin tin (or a couple of tins) with papers. 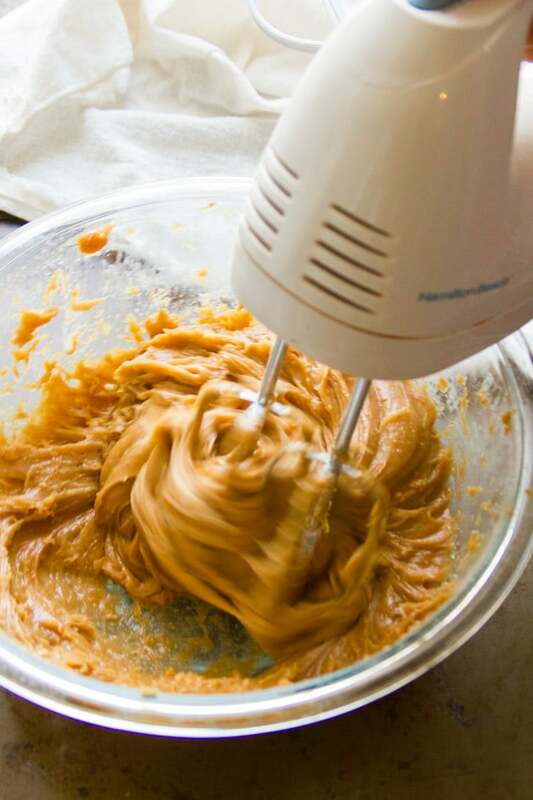 Using mixer on high speed, beat the sugar and butter together in a large mixing bowl, until creamy. Add the vanilla and flax mixture, and continue to beat until well blended. Add the remaining cup of milk, and again continue to beat until well blended. You might notice some separation at this point. This is normal and nothing to worry about. Add about 1/3 of your flour, and the cocoa powder to the bowl. Sprinkle the baking powder and salt on top of the flour and/or cocoa, and then beat the mixture just until blended. Add another third of flour, beat until blended, then beat in the last third. Use a spatula to fold in the chocolate chips, if using. Bake for 15-18 minutes, or until toothpick inserted into the center of a cupcake comes out clean. 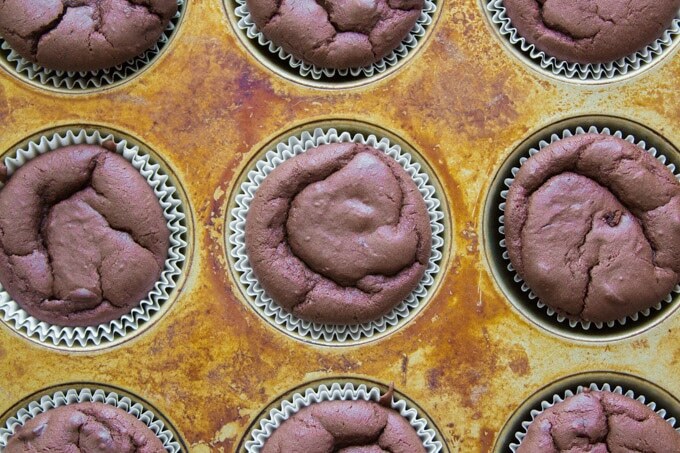 Remove the tin(s) from the oven and allow the cupcakes to cool while you prepare the frosting. Blend everything with mixer on high speed until light and fluffy, adding the confectioner's sugar in increments to avoid taking a shower in it. Once the cupcakes have cooled completely, top them with the frosting. This recipe makes a nice big batch of frosting. If you have any leftover, seal it up for later! The nutrition information assumes you are using the whole batch. I just tried these now. Very easy and very delicious! I really liked this post – yes, I come to your site because I want to know what to make for dinner, and you always deliver! Yours is one of my favorite sites. Thank you for the fabulous recipes. 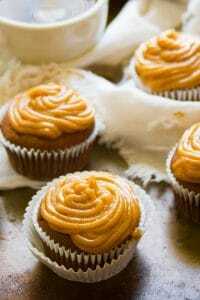 I also like a treat now and then and this cupcake recipe is perfect. I’ll be sure to tag you when making these! Thanks again. Thank you so much Morgan! I’m glad you’re enjoying the dinner recipes! I hope you love the cupcakes too!